As a band of scurvy West Sussex interlopers sneaking across the border in the dead of night for the first time to cause havoc and generally raise hell in our genteel neighbouring county, we were (pleasantly) surprised to see such a strong showing of developers, designers and tech-heads crammed into the wonderful and very relaxed Corner House pub/restaurant (on 71 North Walls, or SO23 8DA for all you GPS fiends). 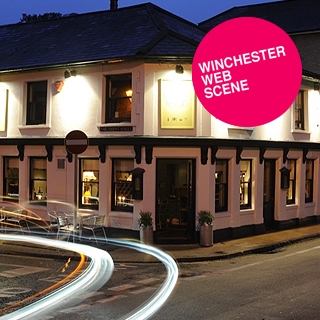 Winchester Web Scene (hereafter known as Winchester Web for the sake of brevity) is held on the first Tuesday of every month, and is on a mission to promote, connect and inspire local talent (of which there is plenty). It should probably go without saying that Winchester Web sessions have traditionally borne witness to unbelievable, staggering scenes of mega-geekery; anyone fancy a round of Pad Racer using no less than two iPads for a track layout with multiple iPhones “tethered” to use as controllers? For the Winchester crowd, this is par for the course. For this happy state of events, we have to thank local hero Syd Lawrence (and self-styled HTML6/CSS4 and AJAZ guru if his Twitter bio is to be believed) for organising the whole shebang and keeping a steady hand on the tiller, despite an always busy schedule of commitments to his numerous clients. If truth be told, we were visiting Winchester Web long before our launch event, and the connections subsequently developed between this particular meetup and Heart & Sole are many and distinguished: Syd gave a stirring talk on the History API at our launch night, and his previous agency, Marmalade on Toast were generous sponsors. If you’ve got a spare 26 minutes and 9 seconds spare, you can see the video of the talk on our Vimeo account. Syd will also be speaking at Heart & Sole #2 this November with brand-new material, and we can’t wait to have him back. Our favourite Winchester Web memory? The 2011 annual barbecue – The infamous British “summer” did its level worst to throw a spanner in the works, and was met with equally British stiff upper lip in reply. Syd laughed in the face of adversity (and torrential rain) and kept the almighty fires burning, and the sausages, provided through the kind sponsorship from our antipodean friends Campaign Monitor, coming thick and fast. And what about everyone else? They came, they saw, they partied and they talked geek long into the night. We’d have to say it was a case of a jolly good effort from all concerned – the weather quite literally tried to rain on the communal parade, but the show very definitely had to go on.